2019 Membership Registration CLICK HERE. 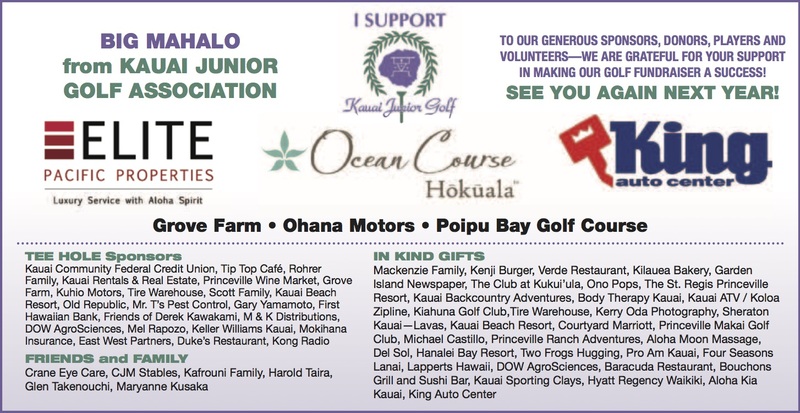 HSJGA FUN FREE HAWAII GOLF DAY- Saturday, March 16th, 2019. Volunteers are needed and appreciated throughout the year. PS. If you know someone that would like to join, and they need clubs have them email us at: kjgaoffice@gmail.com. 2018 Kauai Jr. Golf Registration Process has been Changed! Membership is open to juniors between the ages of 5-18 years. Juniors interested must not have entered college or must not reach their 19th birthday on or before July 19, 2018. To Register your Jr. Golfer, please click HERE. Monthly deadlines for tournaments and volunteer events are strictly enforced. If you are having issues registering for a tournament or signing up to volunteer, please call the KJGA at 808-631-1644 for assistance right away so your issue can be timestamped. Once a deadline passes, the KJGA will not be able to assist you in registering or volunteering for an event. 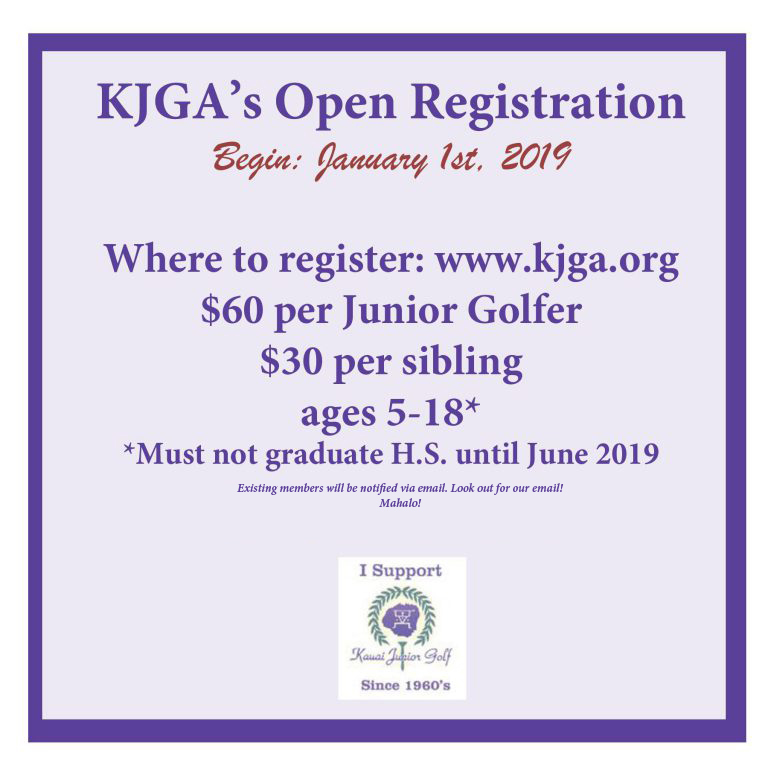 Registration for new and returning members of the Kauai Junior Golf Association (“KJGA”) is OPEN!! Membership is open to juniors between the ages of 7-18 years old. Juniors interested must not have entered college or must not reach their 19th birthday on or before July 14, 2017. KJGA’s annual membership registration is processed through the Hawaii State Junior Golf Association (“HSJGA”). 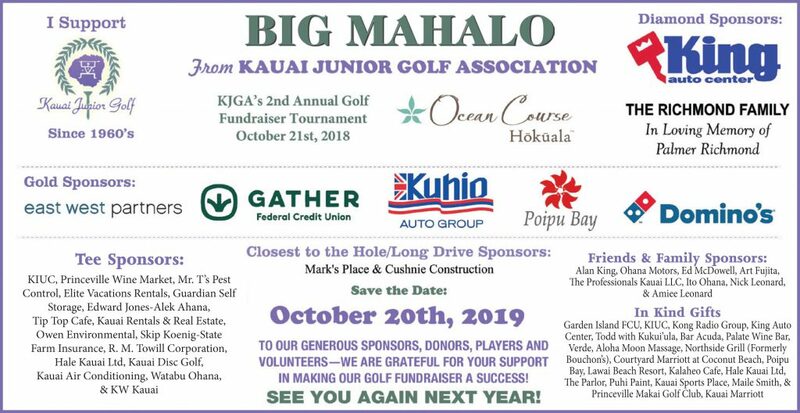 The $95 entry fee includes membership to Kauai Junior Golf Association, Hawaii State Junior Golf Association, along with a USGA membership, GHIN handicap, USGA rules book, golf shirt, bag tag (new members only) and much more! If you have a sibling who also wants to join, please follow the same steps to create his/her own account. The cost is $65 for each, with the same benefits. “For Members” Box. After clicking, a new window will open with the heading at the top for Hawaii State Junior Golf Association. All registration must go through Hawaii State Junior Golf Association. Signing up for membership is also available through HSJGA website. -If you have a GHIN # register with GHIN# and last name; if not, select “Register without GHIN number”. -Complete the required fields and submit. You will receive an email notice from HSJGA once the account has been approved with the HSJGA (may take one or two business days). -Once approved, go back to www.kjga.org – “Returning Member Log In” to access HSJGA account, you can also log in through HSJGA website. Log in with your username and password; from the drop down menu “Season” select 2017 KJGA Season. -Highlight/select the box next to “2017 KJGA Membership Registration”; then go back to top and hit the box “Register For Selected Event”, this will take you into the next section to complete payment. -Complete all required sections along with your credit card information to pay for the $95 fee; siblings who join in the same season will be charged $65 per individual. Remember, fee includes membership to Hawaii State Junior Golf and more! An email will be sent soon after from Kauai Junior Golf Association (“KJGA”) regarding lessons, and more! 2. www.HSJGA.org, scroll down and select Member Log In. Note: Do not create a new account with a new username or password! If you do not remember your username or password, select “recover username and password”. -Once logged in change the season from the drop down menu to “2017 KJGA Season“, select/highlight the box next to “2017 KJGA Membership Registration” then go back to top and select/hit “Register For Selected Event”. -Complete all the required sections and submit your credit card information to renew your membership. An email will be sent once payment registration has been completed. The Parent Junior Golf Tournament is now open for registration! Log in to your account HERE to register today!